Today let’s introduce a vegetable not very widely used here in the U.S. One of my absolute favorite vegetables: The Kohlrabi. This wonderful vegetable can be prepared in so many different delicious ways. Soups, Sautee, Raw, Steamed, BBQ, or just plain part of a stir-fry. Either way it is so delicious. Please pick some up and give it a try, you’ll be pleasantly surprised! 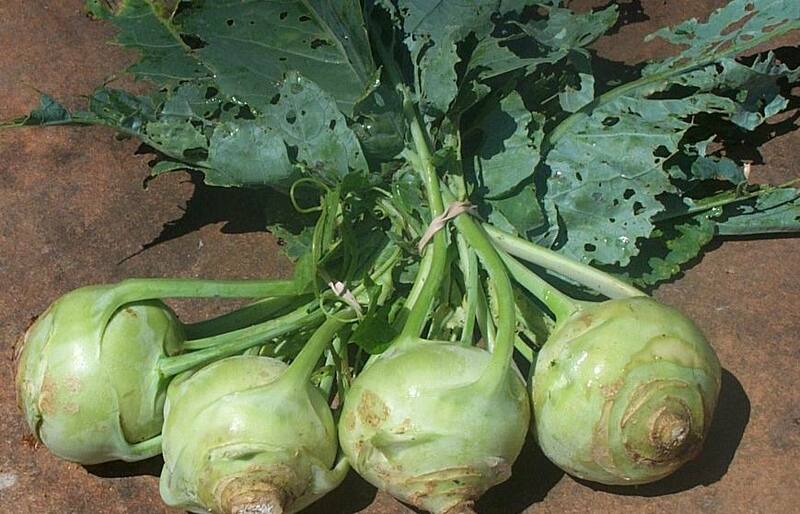 The kohlrabi, Brassica olearcea, is a very popular vegetable and is originally from northern Europe. Most believe it to be a cross between wild cabbage and white beets. People have enjoyed this wonderful vegetable since the 16th Century in Central and Eastern Europe where it was most popular. Kohlrabi is not a root vegetable, it actually grows slightly above ground; it’s pretty. The taste and texture of kohlrabi are similar to those of a broccoli stem or cabbage heart, but milder and sweeter, with a higher ratio of flesh to skin. The young stem in particular can be as crisp and juicy much like an apple, although much less sweet. We used to pull it out of the veggie patch, clean it off and eat it as an afternoon snack while playing in the yard. I wish that kids today could experience how wonderful it is to grow your own veggies. Except for the Gigante cultivar, spring-grown kohlrabi much over 5 cm in size tend to be woody, as do fall-grown kohlrabi much over perhaps 10 cm in size; the Gigante cultivar can achieve great size while remaining of good eating quality. The plant matures in 55-60 days after sowing. Approximate weight is 150 g and has good standing ability for up to 30 days after maturity. It is tolerant to cracking. The flesh is bright green in all varieties. There is almost no taste differences between the bright greenish-white kohlrabi and the reddish-purple colored ones, with the slight exception of the purple being a bit more sweet in taste. The slightly sweet, crisp taste of meat resembles that of radish, while stems and leaves taste a bit more like cabbage. So what’s in a kohlrabi per 1/2 cup raw? You can use red or green kohlrabis, peel and julienne them. (cut large stalks off & discard) Chop small stalks for cooking as well. In a high-rimmed sauce or braising pan, add julienned kohlrabi and cover barely with water, cook on medium-high until tender. In a separate small skillet heat coconut oil with garlic (finely chopped) and cook until golden, add to kohlrabi. In a cup of water add Arrowroot powder mix, and quickly add to cooked Kolrabi. Sea salt and pepper to taste. You may wish to garnish with fresh dill, cilantro or Italian parsley. Enjoy this fabulous side dish with any of your favorite meats or poultry! 7 replies to Kohlrabi Who? Sounds great! I am always looking for new veggies to try and add to what can often be the hardest part of the meal. So to clarify, you cover the kolrabi in water and cook until softened, then (keeping the water in that pan–or should it have cooked off?) you add the oil and garlic from the other skillet and then one more cup of water with the arrowroot? Does this make a soupy dish? Arrowroot is an alternative to corn starch, so does it thicken the dish even if added at the end? I am just trying not to screw this up when I try it out 🙂 Sounds simple and delicious! Cool, thank you for the clarification! A light sauce sounds great–was hoping for that! I’ll give it a try and let you know how it turns out! Thank you again! did you see the MDA forum post? one person suggested also to sautee it with prawns and perhaps tomatoes – 🙂 the combos are endless. Enjoy! I have never heard of this vegetable… I went to my local farmers market for the first time today since it was the grand opening. I will have to be on the lookout for this unique veggie. I love broccoli so I am sure I will enjoy this one! Thanks for adding a new veggie into my life 🙂 I am jotting it down right now. My name is Ashley Mason and I am contacting you on behalf of Bon Appétit magazine. We’re working on an online article about heirloom produce and we came across your image of the “Kohlrabi.” We would love to potentially use this image on our website and appropriately attribute you. I just need to verify that the image above is a White Vienna Kohlrabi. Would it be possible send over the file for this image? Thank you very much and please feel free to contact me if you have any questions.